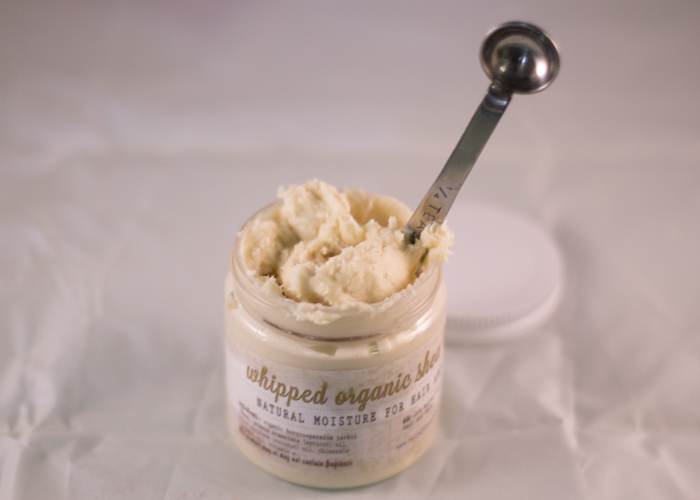 We all love it — but there’s something about Beija-Flora Naturals Whipped Organic Shea Butter that has me lusting for a gallon-size tub of this goodness. Perhaps its the airy, whipped texture that is easy to scoop out and melt into my skin, leaving a soft sheen and gentle moisture. Or maybe its the sweet scent of vanilla cookies with a touch of coconut that comforts me as I massage it into tired feet and sore hands. Whatever it is, I’m sold on Beija-Flor Naturals Whipped Organic Shea Butter. And that’s all it took to capture my heart. So simple — yet the whipped texture feels new to me, and while the shea maintains that thick, wrap-my-buttery-arms-around-your-body consistency, it just feels light and airy and very calming to spread across the skin. I’ve tried a bit of it in my hair (think half the size of a dime for my fine hair) to style when I’ve forgotten to pack my typical pomade, and while it was too heavy for me, it gave my hair this pretty gloss that I consider experimenting with a bit more. Hello, sleekness! If you have thick, dry hair in need of taming, Beija-Flora Naturals’ Whipped Organic Shea Butter could be a great multipurpose product for you! Bonus: If you’re in the Bay Area, Beija-Flor Naturals’ founder, Stevonne, has a shop in Oakland called Concept Forty-Seven where her line lives along other natural beauty babes such as Vapour Organic Beauty and John Masters Organics. Final verdict for me? Definitely a re-purchase. And maybe it will be in person sometime in 2014! What’s your go-to shea butter? Tried anything from Beija-Flor Naturals? Tell me in the comments section!